It’s not surprising really. The writing appeared on the wall years ago. And the translation handed down just as far back. While physical newspapers will not die anytime soon, the consumer of news is moving on. To the internet. Today, local daily newspapers The Herald and The Daily News published the results of the Zimbabwe All Media Products Survey (Zamps) for the July to September period. Just part of September we guess. 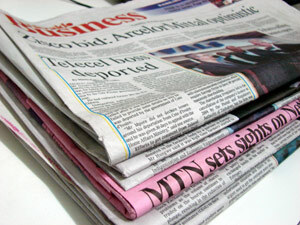 The results mainly show that newspaper readership continues to decline in Zimbabwe. Like it is in other African markets that have similar literacy rates and general technology penetration. Newspaper readership in the quarter declined to 59%. This is a decline from 64% recorded last year for the same quarter. Even though the newspapers today carry positive angle titles to the reports, it’s not hard to see the facts. Again unsurprisingly, the Herald article says their internet version’s readership is on the rise, increasing from 1% readership to 3%. Thankfully, the Herald Editor, Innocent Gore, can see the cause and in a comment about the survey results called for “innovativeness and continuous improvement in the packaging and presentation of news.” We hope the other newspapers are waking up to this reality as well. We noticed a weird statement in the Herald report; “At least 1 053 805 people now have access to Internet.” The statement just stood there on its own and we have no idea what it means. We haven’t gotten our hands on the survey report just yet so you can imagine. Is this the general number of people that use the internet? If it is, then it’s definitely very incorrect. Zimbabwe should have at least 3 million people that have access to the internet currently. Econet, Zimbabwe’s largest mobile telecoms company (and the country’s largest internet provider), estimated Zimbabwe’s mobile broadband penetration at 22% this time last year (slide 14). Out of an estimate total population of 12.5m people, that’s about 2.7 million people that were connected to the internet more than a year ago. And remember, this is just mobile broadband; they left out those that use PCs. It’s not the first time, by the way, that these Zamps survey results have been questionable. According to the Herald, Research Bureau International carried out the Zamps survey on behalf of the Zimbabwe Advertising Research Foundation (ZARF). ZARF itself is comprised of representatives from the media and advertising industries. It was set up to find out the number of people that consume the different media products on the market. The research is funded by a 1.5% surcharge on all advertising. The readership drop from 64% to 59% this year can be explained by people affording less and less? Not saying the papers are not expensive. just saying this significant decline in readership year on year is much more than just price. These guys used to sell more papers a day at this same price. disagree. if anything, the middle class is growing and that more people would be buying newspapers if they didn’t have the internet. the trend is clear even without Zamps’ survey. Only if the news is more sub-par than it was last year.